Playing with the Kinect hacks are a lot of fun. Getting the hacks to work on the Mac, not so much. OK, not AS much. However, we REALLY REALLY wanted to see the Kinect running on OS X. So we banged our heads until we figured it out. Once we got things to work, we realized the instructions were actually quite accurate. They just needed a few clarifying steps. Hopefully, by pointing out where we went astray, we can help keep those of you interested in venturing down the same path from wandering around. Before downloading any of the hacks and demos, the first item of business is to install some software development tools. Fortunately for Mac users, the tools are supplied by Apple and they are completely FREE. The latest version of these free tools is Xcode 4.Xcode 4 is a fully integrated (editor, compiler, debugger) software development environment and is specifically for creating software for Apple devices (Mac, iPhone, iPad). It is the version that we used for compiling and running all of the OS X Kinect demos and hacks. Like all Apple software installations, it is pretty much a one-click installation. Readers should not encounter any problems with the installation of the development environment. If there are any problems, Apple has a very active and helpful forum just for developers. Kinect hacks are often built on libraries from different sources. Getting them to all work together can be a challenge and this is often where novices can get tripped up. This has gotten a lot simpler since things got packaged up in a collection called “ofxKinect.” ofxKinect is an Open Frameworks addon for the Xbox Kinect that can run on different platforms (Linux, OS X, etc…). In order to make things crystal clear for newbies, we asked our interns to download the code from the Web, compile it, and bring up the demo. Along the way, we watched and noted what got them confused. Hopefully, by pointing out a few things which tripped up our interns, we can help make it easier for others. When you grab updates from places like Microsoft and Apple, they have spent a huge amount of time and resources to make sure that everything works nicely together. Not so much with open source code. If things are specified to work with a certain version, use that version. Any other combination is a crap shoot. The first thing to note when grabbing code is the version number. 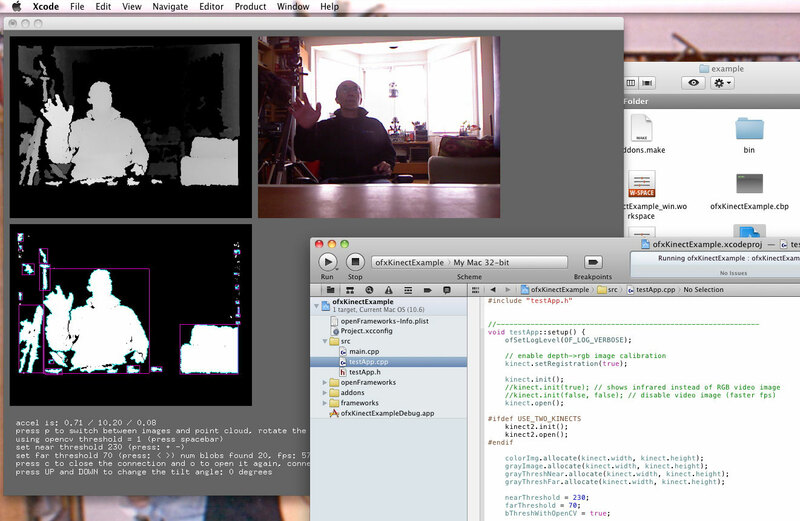 For the ofxKinect demo, we grabbed the 0062 version of both the ofxKinect and OpenFrameworks source code. BTW, just as an exercise, we tried compiling different combinations (0062+007, 0062+Head, etc…) of the two libraries and none of them worked. So if you are having trouble getting the code to compile, chances are the versions are not compatible. Another thing to pay attention to is where you are placing the folders. 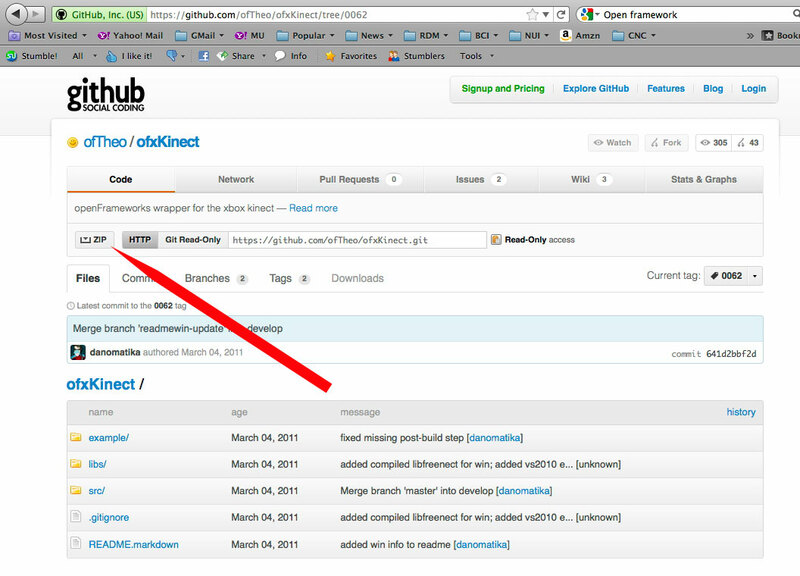 In some demos, the files must be placed into the Examples folder. For the ofxKinect demo, everythinghas to go into a new folder inside “addons.” If you place it anywhere else, it will have trouble finding what it needs and you will get hundreds of build errors. If you don’t mind getting your hands dirty, then by all means, download the latest and try to get them all to play nicely together. However, the basic take-home lesson we learned is: if you don’t want to flounder around, use the EXACT versions specified by the originating developer. When everything works, then Xcode will come back with a message indicating that the application has been successfully built. It will also automatically run the application. At this point, if you have not stayed up all night and really want to go to sleep, then you are ready to check out the demo.